Over the course of the past 20 years, while there have been many gains and wonderful discoveries for Sub Sea Research, there have also been a number of losses and near misses. 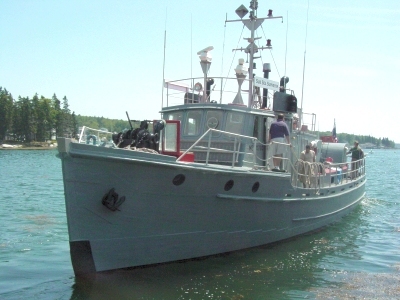 One of the more devastating events for the company came in 2006, when the salvage vessel Surveyor perished while sitting at the dock in Maine. On one of the coldest nights of the winter in December 2006, my father Greg Brooks was on his way back from a vacation when he received a call from his marina, notifying him that there was a fire on his research vessel, the M/V Sub Sea Surveyor. He hurried to the marina, still dressed in only a light jacket from his vacation. The Surveyor was being heated by a diesel furnace over the winter, and it appeared as though there may have been an issue with the furnace that caused the fire, though the exact cause is still unknown. When he arrived a little after 11pm, the docks were crowded with teams from the Coast Guard, EPA, Maine Marine Department, police station and fire station. The fire was put out, but the water from this began to flood the boat. Surveyor was listing to the starboard side, and my dad knew it would need to have the water pumped off immediately. He asked the fire department to pump out the boat, and the EPA said the same. The Portland Fire Boat crew told my father that it would be taken care of and that he could go home. Freezing in the below zero temperatures, my dad hurried home, feeling assured that the problem would be corrected. The next morning, my dad arrived and noticed the boat was very low in the water. The flooding had not been taken care of as promised. There were pumps sitting on the dock, belonging to the Coast Guard. My dad and his crew wanted to use the pumps immediately, but the Coast Guard insisted that they had been told to pick up the pumps, not to use them. The argument continued, and at this point the Surveyor was sinking. My dad told them that the flooding had to be taken care of right then, or the boat was going to go under. When the guard still refused, the Surveyor sunk, at approximately 8:30am on Saturday December 9th. Seeing the ship go down was devastating to my dad and his crew. He likened it to watching his own house be destroyed. The disaster could have been averted if the guard had just let them use the pumps. My dad had tried to acquire other pumps, but since it was early Saturday morning no shops were open and no phone calls were returned. The ship lay by the docks, completely submerged in the icy Atlantic. The Coast Guard sprang to action, saying an oil boom would need to be placed around the wreck to ensure it wouldn’t leak. A company specializing in placing oil booms showed up and quoted my dad $65,000 for a 100 foot boom. Seeing as he was still going to have to pay to get the ship out of the water and cleaned out, this was a devastating blow. It felt like everyone was out to take advantage of the situation, and this would only get worse over the next few days. My dad found someone who could raise the ship for only $5,000, and he got the owner of the marina to agree to letting this man and his crew work. Another man wanted the money, so convinced the marina owner to let him and only him do the recovery – for $50,000. When the person who my dad had hired showed up, the marina owner refused to let him in. At this point, he would not even allow my dad onto the dock unless he agreed to the new deal. In addition to this stress, the ship was about to be filed as a federal oil disaster. If it got to this point, they would have to send divers down to vacuum out the oil lines, which would cost upwards of hundreds of thousands of dollars. My dad had no choice – his hands were tied, and he had to pay the $50,000 to get the ship out of the water. My dad’s partner John Hardy was in the hospital at this time, and since he was a co-owner of the ship, they needed his signature to lift the wreck. The marina owner and the man who was charging them 50k insisted on visiting the cardiac unit of the hospital to get John’s signature, even though he was about to have surgery. My dad was overwhelmed and disgusted by this, but again was left without options. Unfortunately, the damage to the Surveyor was too great and it ended up sinking again, with a new owner to deal with the consequences. This was an awful chapter in Sub Sea’s history, but one that showed the company’s determination and ability to overcome tragedy.